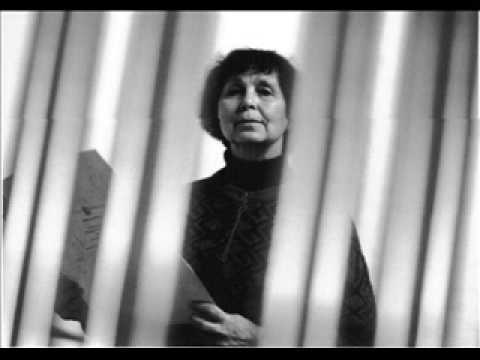 Sofia Gubaidulina Interview with Bruce Duffie . . . . . .
Sofia Asgatovna Gubaidulina was born 24th October 1931 in Tschistopol, a small town on the Volga in the Tartar Republic of the USSR. Her father was Tartar, but her mother was Russian and Russian is her native language. When she was small, the family moved to Kazan. She graduated from the Kazan Conservatory in 1954, before transferring to the Moscow Conservatory, where she finished in 1961 as a post-graduate student of Vissarion Shebalin. In the Soviet period she earned her living writing film-scores, while reserving part of every year for her own music. She was early attracted to the modernist enthusiasms of her contemporaries Schnittke and Denisov but emerged with a striking voice of her own with the chamber-orchestral Concordanza (1970). During this period she built up a close circle of performing friends with whom she would share long periods of improvisation and acoustic experiment. Out of these experiences came many works, such as the Concerto for bassoon and low instruments (1975, for the bassoonist Valery Popov), The Hour of the Soul (1976, rev.1988, for the percussionist Mark Pekarsky with voice and orchestra) and ground-breaking pieces for the accordionist Friedrich Lips like the frequently played De Profundis (1978). From the late 1970s onwards Gubaidulina’s essentially religious temperament became more and more obvious in her work. Already in Soviet times, when the public expression of religious themes was severely repressed, she was writing pieces like the piano concerto, Introitus (1978), the violin concerto for Gidon Kremer, Offertorium (1980, rev.1986), and Seven Words for cello, accordion and string orchestra (1982, published in the USSR under the non-religious title ‘Partita’). Since the arrival of greater freedom under Gorbachev, religious themes have become her overwhelming preoccupation. Many of her religious works are on a large scale, including a cello concerto inspired by a poem about the Last Judgement (And: The feast is in full progress, 1993), Alleluia (1990), for chorus and orchestra, a concerto for cello and chorus for Mstislav Rostropovich and, most recently, the colossal Passion according to St. John (2000), a German commission to celebrate the Millennium, given its first performance by the soloists, chorus and orchestra of the Kirov Opera conducted by Valery Gergiev. Much of Gubaidulina’s more recent work also reflects her fascination with ancient principles of proportion such as the Golden Section. This is particularly clear in her chamber cantatas, Perception (1983) and Now always snow (1993) as well as in orchestral pieces like Stimmen… verstummen… (1986), Pro et Contra (1989) and Zeitgestalten (1994), this last being written for Simon Rattle and the City of Birmingham Symphony Orchestra. 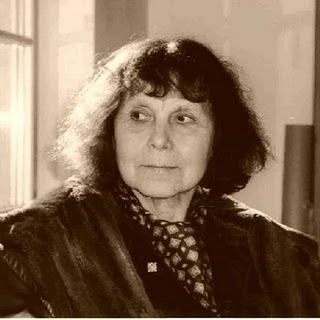 Since the collapse of the Soviet Union, Gubaidulina has lived in a small village outside Hamburg, Germany, where she delights in the peace and quiet she needs to fulfil the huge number of commissions she has received from all round the world. Works by Gubaidulina are represented by Boosey & Hawkes in the UK, British Commonwealth (excluding Canada) and the Republic of Ireland. As I have mentioned in other presentations on this website, these interviews were generally first used on the radio. Since I was the announcer as well as the producer, it was my responsibility to pronounce the names correctly. Usually, I asked them to do a station break, which included their name and our call letters. Where this was not feasible, such as with a guest who spoke no English, I simply asked them to say their name so that I could hear it. While the solution seems simple, it amazes me how often an interviewer or reporter simply does not ask the guest. Print journalists usually ask for spellings, but broadcasters seem to neglect (or ignore) the need for precision in this detail. While I worked completely alone (without assistants of any kind), just about every other media outlet uses both on-air talent and behind-the-scenes production personnel. With at least one helper or overseer, any blame for mistakes rests not only with the person asking the questions, but also with the support staff whose job it is to watch over the big picture and the tiny detail. That being said, Sofia Gubaidulina obliged, and responded so-FEE-uh goo-bye-DOO-lee-nuh. That is how she said it to me. It was not the translator's rendering, but straight from her own lips. With that out of the way, let me say what a distinct pleasure and special privilege it was to meet and spend an hour with this significant composer. Her music continues to gain acceptance and recognition through performances and recordings. Her influence grows and her inspiration seems to deepen with each new work. She was in Chicago in April of 1997 for the premiere of her Viola Concerto with Yuri Bashmet and the Chicago Symphony Orchestra. [See my Interview with Yuri Bashmet.] After having met the composer briefly on the evening of the performance, we got together the following afternoon for our conversation. My thanks to Ilya Levinson for translating my questions into Russian for the composer and then rendering her respsonses into English. Here is that memorable encounter . . . . . .
Bruce Duffie: Thank you very much for coming to Chicago. 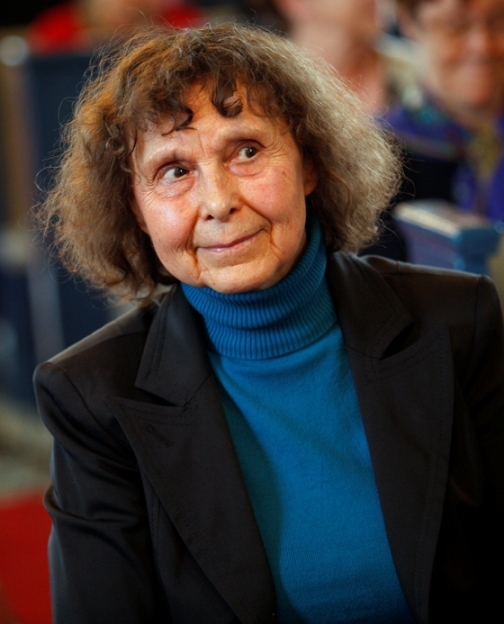 Sofia Gubaidulina: I am very glad that I came to this wonderful city. BD: You are offered all kinds of commissions. How do you decide which ones you will accept and which ones you will turn aside? SG: It's very difficult question; it's very hard to choose, but every time I have a different answer. BD: What kinds of things influence your decision? SG: The main thing is that I am limited in time. I consider if the commission's very interesting, and if it's connected with very good performers or with very interesting combinations of instruments. BD: Once you get the piece written, do you expect the performers to have input into it, either during the composing process or when it gets performed? SG: In general, I meet with the performers only after the piece is written. But I have a feeling that piece is not completed before I have meetings with the performers. I have an impression that the art of composing is different from all other arts; the composer does not do the whole work, but he does half of the work. It is absolutely necessary that the performers would be active in this process, that they would not only read the score, but would bring an active input. In this case the real piece can be born. BD: Do you know before you start about how long it will take to complete the compositional process? SG: It's very difficult to calculate. BD: Does it ever surprise you how long or how short it becomes? SG: It will take as much time as is needed. We are talking about the process of baby birth. BD: When you're working on your piece and getting all of the notes put on the paper, how do you know when it is finished? SG: You can make this conclusion by looking on the score; if there are no page numbers, no rehearsal numbers, no dynamics, or if there is no final bar line, you can tell that the piece is not finished. BD: When you're writing a piece, are you always in control of it, or are there times when the notes seem to be leading your hand? SG: [Thinks for a moment.] Yes, I am controlling my process. BD: Does the piece ever fight you at all? SG: I wouldn't say that the piece fights me, but there is certain resistance, a discrepancy or gap between what my unconscious intuition wants and the structuralities that I want to impose on my pure intuition. SG: In general, the intuition wins. Even in the case when the structural support would dominate, still intuition wins; it's more important that intuition would dominate. For me the most important thing is not to interfere with intuition, not to get in the way of intuition. I understand that this solution can be very different for different composers; they can have different solutions for this problem. There are different types of composers, and one type tends to be more strong in intuition, and another one more strong in intellectual. I'm not judging whether it's good or not; it doesn't mean that it's good or bad. SG: The main thing is that for the person who has a very strong intuition, he would not encounter any resistance from the intellectual side. And for the person who has very strong intellectual side of his genius, this intellectual side would not overpower the emotional, or intuitive side. BD: Is this just about other composers, or also the performers of your music? SG: It is about the composers in general. SG: Yes, yes. I had many wonderful moments when I felt that my composition was executed impeccably. I heard impeccable execution. Many performers are interested in note-perfect performance; they're not interested just to perform. I know that a performer would not be satisfied just playing a piece, but they would strive for perfection. BD: Is this perfection ever achieved? SG: Not always, and of course it can be very rare, but striving for perfection is very important. Our life is not perfect and every motion is not perfect; only God is perfect. We of course leave a gap for our life and our existence. We can count on that. Life is based on the fact that from the beginning there is an imperfection. SG: In my opinion, it's not for what, but why; it is not a purpose but a reason. There is a deep necessity for human beings to realize his or her unconscious. BD: And music enables this? SG: This is art; this is not only music, but it's an art. This is what art does; it's absolutely necessary. Humanity is not satisfied with just an upper layer of our consciousness. It's absolutely necessary to go into the unconscious and take it out. BD: Do you purposely build this into your music, or do you just find that it's there once the music is written? SG: I wouldn't say that it's my goal. When a person composes music, it's a necessity but not a goal. BD: You absolutely couldn't live without it. SG: I wouldn't be able to live without it; I know it for sure. BD: Without getting into political ramifications, did this help to sustain you in the early part of your career? SG: Yes. This was only what helped me to survive in a very difficult political and ideological situation. BD: Has your style or method changed at all, now that you are freer to speak and be heard? SG: I don't think so; I don't see in myself any changes. BD: You were always true to herself? BD: [Quietly applauding her] Brava! [Laughter all around] What advice do you have for younger composers coming along? SG: I don't belong to the circle of people who want to and can give any such advice. Usually advice can be given by a person who is born a teacher, and advice can be given by a person who knows the answer. Personally, I live in the world of questions. BD: Is it your music that answers at least some of these questions? SG: I think that an artist of my type does not answer, but poses questions. Composition by itself is a question. BD: So the finished composition is a question rather than an answer? BD: Is it the performer that answers it, or is it the audience hearing it that answers it? BD: Is there an answer? SG: I think that there is no answer. BD: When you're writing a piece, are you conscious of the audience that will be listening to it eventually? SG: This is very complicated question. Sometimes when these thoughts occur, it can bother the composer and can limit his freedom. A lot of limitations will be born, and from my point of view it will be on the way of concentration during this period, and taking out from the unconscious everything that the artist wants to transmit. BD: Have the audiences basically received your music well? SG: Of course. Of course. BD: Is the music you write for everyone? SG: I'm not sure. I think that not only mine, but no piece of art is written for everyone. It is very individual. There will be people who would respond to the artist, and there will be consonance between the listener and the artist, but it's very rare. It's very rare. I understand this and I cannot say that this piece is for everyone. But in any case I don't have any prejudice towards an audience which is not musically literate. I even think that the audience which is not musically literate can accept the piece easier, and go with the flow of music. I did encounter such audiences, especially in Moscow. Once, after the concert of my music, people came to me and said that they never went to any classical concert before. SG: Concerning the distribution of the tickets, none were sold, but the tickets were distributed to different factories and institutions for this concert of my music. It was very strange because my friends wanted to come to this concert; they went to the box office and were told that there were no tickets! The audience that came to this concert was absolutely not prepared to any kind of music; they received tickets for free, and the concert was very successful. Afterwards, strangers were coming to me saying that they never came to any concert before, but they liked my music! I think that this happened because the performers were of a very high caliber. It was a great concert in the sense that each piece was performed with such a perfection — not in the sense of perfect execution of the notes, but in a very musical sense. It shows that for the listener, what is important is truthfulness; then they can go into the music. It needs truthfulness and seriousness. BD: Can we then expect those people who had never been to a concert before to come to other concerts of their own volition? SG: Yes. Strangers came to me after the concert and congratulated me. They said, "Now we will go to concerts and we will follow a concert life! BD: Good! So you are like a teacher! SG: No. If I would be a teacher, it would not happen. It's absolutely impossible to say that you need to do this and that and have them believe it! No. It's absolutely a different position. BD: Would you consider yourself the "right kind" of propagandist? SG: Propagandist? No. If I would be a real propagandist, [chuckles slightly] this effect would not happen. This was the ideal case when the piece of art did happen, when it was written and performed for the Art (with a capital A), not for the public. The piece was written and performed not with the purpose to teach or to do propaganda. It was a piece of art that was done solely for the sake of Art, for Music. BD: Does it do your heart good to know that that public "got it"? SG: Of course. Of course. It was a present for which I could suffer for a long time. For this, the artist can after go with a lot of hardship in life, but it's very important, once, to receive such a reaction from the listener. BD: That kind of reaction makes it all worth it. BD: Does it please you that many of your works have now been recorded? BD: Are you basically pleased with the recordings since they have more universality than single performances? SG: Yes. Of course there are recordings that I did not control, and after I listened, I realized that there were some wrong tempi... or maybe I put wrong tempi in the score. There are some imperfections. Concerning universality, we always go towards compromise, and it's better to have a more neutral performance then no performance at all. 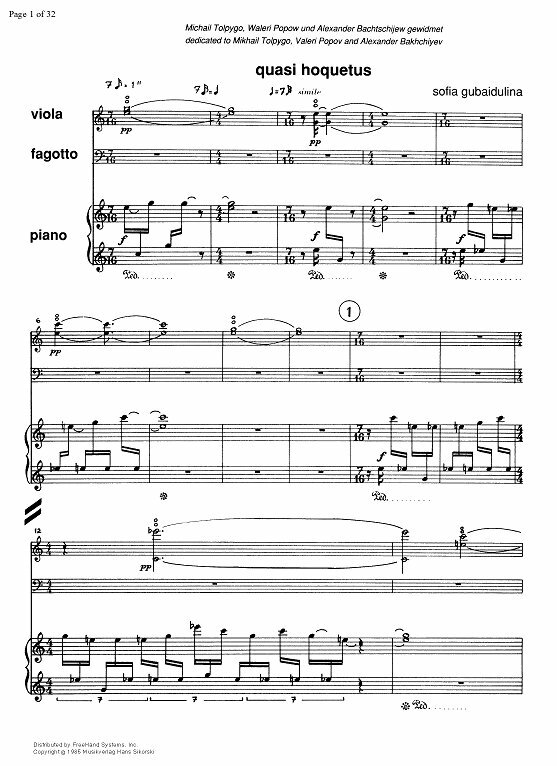 BD: Is there not more than one way to perform any one of these compositions? BD: Are there times when the performer discovers things that you didn't know you had put in the score? SG: Yes, very often. I did learn, and I will learn from them because each performer knows his instrument so intimately that a composer needs to learn from them. BD: Do you work on just one composition at a time, or do you have a couple going at once? SG: On just one piece at a time. BD: Do you ever get an idea that you know won't work in this piece, but you save it for another piece? SG: If we talk about structural ideas, yes, but not about the acoustical ideas; the form, but not actual melodies or distribution of notes. BD: If you're writing, say, a viola concerto, might you get an idea that you know would be much in a trumpet concerto or a piano solo? SG: You can divide the process of composition into several stages, and for me, the most exciting is the beginning of the piece. This is a moment that I can call a real pleasure, that you can really apply this word. This is a moment when there is a chord that is shining with all colors and sounding with all notes; just one moment. This is a vision which is connected with aural and visual impressions, but unfortunately it's just one moment. After that, when you try to understand what is there, this process that we would call necessity is not fun. BD: You have to figure out what it is you have seen in this flash? SG: Yes, to understand what it means, and what formal responsibility I need to take in order to realize it... and of course fear that it won't happen. BD: Is it just simply transcribing, or is it really working out the solution? SG: No, this is working out; this is not transcribing. This is work that will help to transform what wasn't seen or felt in that flash to what can exist in real time. BD: Thank you for all of the music that you have written and all the music yet to come. 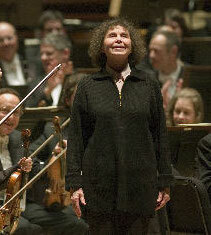 Gubaidulina made her first visit to North America in 1987 as a guest of Louisville's "Sound Celebration." She has returned many times since as a featured composer of festivals — Boston's "Making Music Together" (1988), Vancouver's "New Music" (1991), Tanglewood (1997) — and for other performance milestones. From the retrospective concert by Continuum (New York, 1989) to the world premieres of commissioned works — Pro et Contra by the Louisville Orchestra (1989), String Quartet No. 4 by the Kronos Quartet (New York, 1994), Dancer on a Tightrope by Robert Mann and Ursula Oppens (Washington, DC, 1994), the Viola Concerto by Yuri Bashmet with the Chicago Symphony conducted by Kent Nagano (1997), Two Paths ("A Dedication to Mary and Martha") for two solo violas and orchestra, by the New York Philharmonic conducted by Kurt Masur (1999), and Light of the End by the Boston Symphony Orchestra under Masur (2003) — the accolades of American critics have been ecstatic. 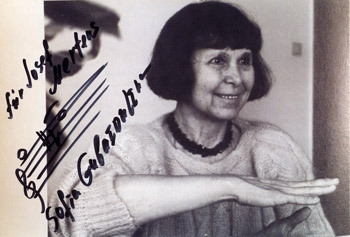 In January 2007, Gubaidulina was the first woman composer to be spotlighted by the BBC during its annual “composer weekend” in London. Among her most recent compositions are Feast During a Plague (2005), jointly commissioned by the Philadelphia Orchestra and the Pittsburgh Symphony Orchestra – and conducted in Philadelphia by Sir Simon Rattle and in Pittsburgh and New York by Sir Andrew Davis – and In Tempus Praesens, a new violin concerto unveiled at the 2007 Lucerne Festival by Anne-Sophie Mutter with the Berlin Philharmonic under the baton of Rattle. 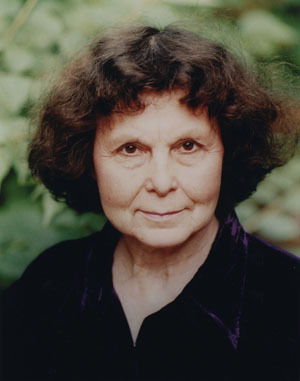 Gubaidulina is a member of the Akademie der Künste in Berlin and the Freie Akademie der Künste in Hamburg, of the Royal Music Academy in Stockholm and of the German order "Pour le mérite." She has been the recipient of the Prix de Monaco (1987), the Premio Franco Abbiato (1991), the Heidelberger Künstlerinnenpreis (1991), the Russian State Prize (1992), and the SpohrPreis (1995). Her most recent awards include the prestigious Praemium Imperiale in Japan (1998), the Sonning Prize in Denmark (1999), the Polar Music Prize in Sweden (2002), the Great Distinguished Service Cross of the Order of Merit of the Federal Republic of Germany (2002) and the Living Composer Prize of the Cannes Classical Awards in 2003. In 2004, she was elected as a foreign honorary member of the American Academy of Arts and Letters. 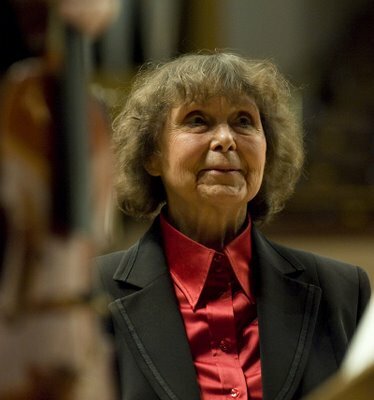 Her music is now generously represented on compact disc, and Gubaidulina has been honored twice with the coveted Koussevitzky International Recording Award. Major releases have appeared on the DG, Chandos, Philips, Sony Classical, BIS, and Berlin Classics labels. This interview was recorded in Chicago on April 18, 1997. Portions (along with recordings) were used on WNIB in 2001, on WNUR in 2005, and on Contemporary Classical Internet Radio in 2005, 2006 and 2008. This transcription was made and posted on this website in 2011.